DMA ‘helps money flow into the world’s emerging economies’ through a number of vehicles including investment summits for sovereign governments, through reducing the costs of international remittances and through deepening financial inclusion in emerging economies. Social Media: we run their Twitter and LinkedIn social media channels. Insights: research on new groups of potential Delegates to engage and ideas on new influencers, including entrepreneurs, to follow. Hashtag strategy to help raise our profile. 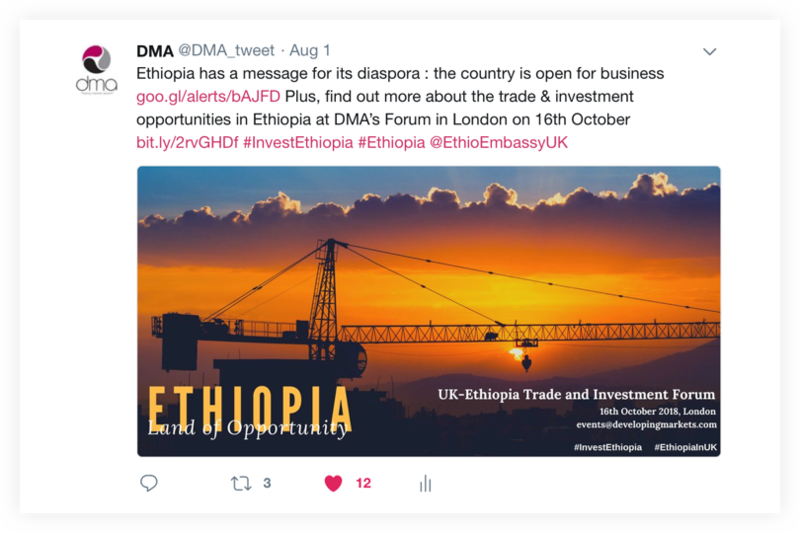 Promotion of our Forums before, during and after our events, helping us to demonstrate to the UK Embassy teams how we help promote them. Promotion on relevant LinkedIn groups. Media liaison with platforms such as the Financial Times, Thomson-Reuters, Bloomberg to create coverage of the events and interviews with key Delegates such as Prime Ministers. Strategy: ideas on how DMA could evolve into new markets and opportunities. They just got on with it, revitalising our social media, leaving me and my team to focus on our Forums and other activities. We trust them, and could not ask for more from their work.